Cherry red, medium-sized, formal double flowers. Upright and vigorous growth. Flowers March/April. I particularly like this imbricata form and I was very pleased to find a grower as it is not on many lists. We already have one, but it is being strangled by a very robust maccabeanum and action will have to be taken which it may very well not survive. 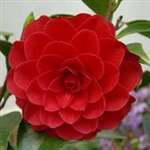 It is loaded with buds and promises a superb display. All the comments above also apply. Thanks again.